A great wedding videographer will do everything they can to understand what makes you you – crafting the film to suit the aesthetic and mood of the wedding, and the personalities and unique story of each couple. Trust me, after a full day of shooting and over 70 hours of editing, it’s hard not to become well acquainted. As a videographer, it’s a privilege to have that special access to someone else’s story, and it means we can infuse that knowledge into the video – incorporating the sound of your father who flew all the way from Greece tearing up during his speech, the texture and movement of your amazing dress that you and your girlfriends spent hours choosing, the first look, the from-across-the-table looks, every look! Remember how fast your 21st went – where you barely had the time to talk to anyone, and then didn’t remember how the night ended. Times that by 10. A wedding video gives you and your family the opportunity to relive your perfect day from beginning to end. More than that, you get to witness moments you never would have been able to otherwise, from different perspectives. 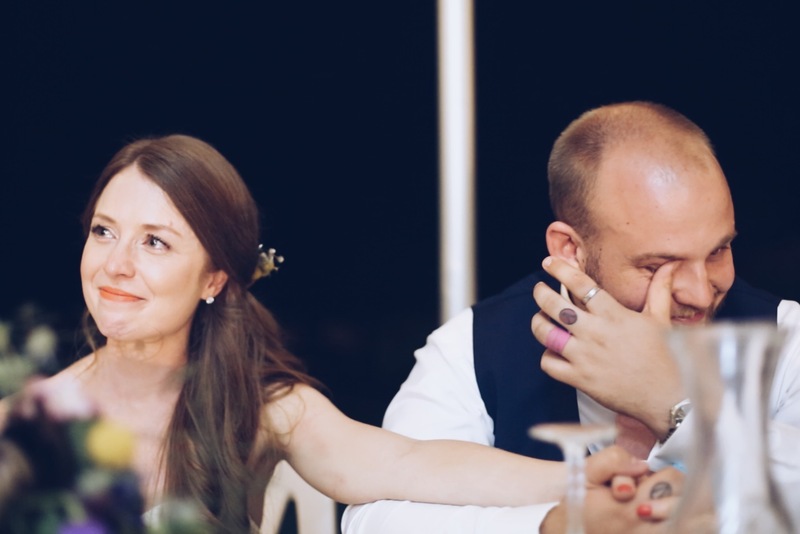 It’s very special for a bride to see the nerves on her husband-to-be’s face as he waits for her to appear. Photography catches moments that are beautiful, memorable and predominantly intentional. But there are moments in between moments that photographers just can not physically capture. Video doesn’t miss a beat, and candid is everything on a day like your wedding where a lot can feel staged. If you thought your favourite song could bring on a wave of emotion, think about that paired with video of your first dance – maybe in the rain, with your parents crying in the background, with a subtle whisper from your love. Music is powerful and combined with footage of your favourite day ever, you can’t really top it! If that helped but you just need a final push to book in a videographer, get in touch here. We’d be more than happy to help.